Roadside Retail: The Disneyland of UK service stations? The Disneyland of UK service stations? 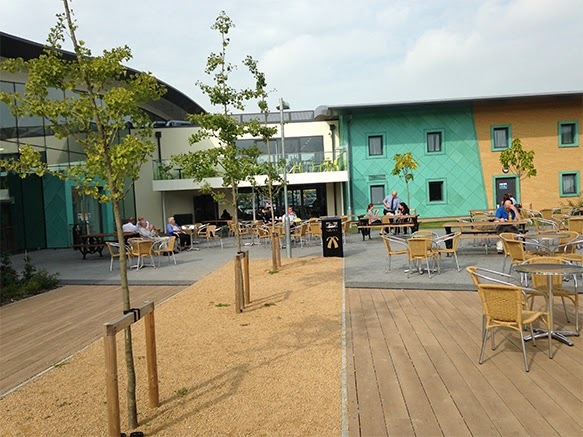 Located on the M25 near Cobham, the Extra Motorway Service Area (MSA) opened last September after a long and protracted period of planning. One year on, does this multipurpose roadside development still lead the way in cutting edge design and green initiatives? And was the £75m investment money worth spent? 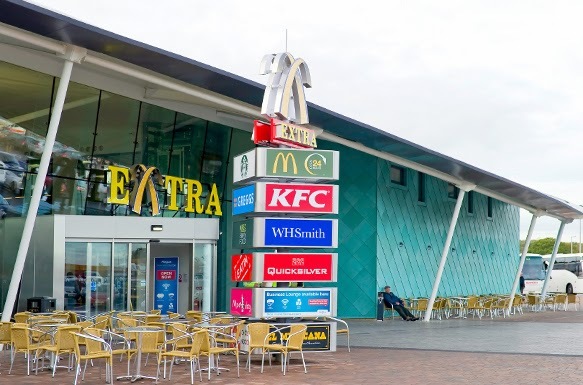 Cobham MSA is one of nine motorway service areas of the Extra Group - the youngest and fastest growing of the four main UK operators in a landscape dominated by Moto, Welcome Break and Road Chef. At 6300 sqm, the Cobham site is the ‘big sister’ to Beaconsfield MSA on the M40 and shares many of the design details of the earlier scheme according to Architecture 519 who secured planning approval for the contentious development. Cobham MSA is designed by Devereux Architects in partnership with BAM Construction and Broham Forecourt Development. Site architecture is functional, with a pleasing aesthetic, typical of many new UK roadside service destinations. Distinctive green copper cladding (TECU Patina, 100% recyclable, supplied by KME) adorns the exterior of the amenity retail building and adjoining (alcohol licensed) 75-bedroom hotel. It's certainly eye-catchingly attractive but one is hard pressed to see how this decorative element can be justified given the world's supply shortage of copper and its comparatively high expense. Granted however, there are plenty of sustainable and cost-effective features neatly integrated into the overall design - for example a generous rainwater harvest facility and large solar wall installation capable of providing enough power to preheat the main concourse and food court building. Cobham MSA offers our international readers an excellent insight into what constitutes a modern UK roadside destination, one that appeals to all consumer segments including families, remote and mobile workers, professional truck drivers, day travelers, disabled users, as well as tourists thanks to its strategic location between Heathrow and Gatwick. Its position is also particularly pertinent given it is situated on one of the busiest stretches of road in the UK. No surprise therefore that Britain's largest filling station is on site. With 36 (18x2) forecourt pumps and six dedicated high-speed heavy goods vehicle (HGV) pumps – totaling 141 nozzles – the Shell-owned station can serve as many as 3,500 vehicles a day. Aside from fuel, its forecourt shop sells roughly 210 litres of coffee and up to 300 snacks a day on a typical day. Natural lighting floods the 4000 sq metre food court and concourse through floor to ceiling glass paneling, providing a pleasant atmosphere in which to shop, eat and relax. To newcomers, it can feel akin to an airport food court inside. In terms of eateries, there are plenty of world cuisine options with tenant partner brands such as El Mexicana, Chozen Noodle and Carvery Express. Our reviewer opted instead for a jacket potato and mushy peas at Papa John's, but there are several other QSR options such as McDonalds and KFC, or alternatively M&S Simply Food for healthier food-to-go snacking and convenience meals. Outside the atrium building, there is a large lakeside terrace with landscaped grounds so eating al fresco in comfortable surroundings is possible, weather permitting. 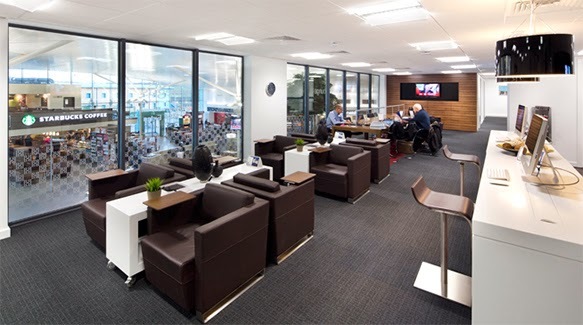 One of the plus points about Cobham MSA is its Business Centre and lounge facility run by Regus UK Express. Our reviewer was impressed with the range of business services and meeting rooms on offer and initiatives to harness a "third place working environment" and strong business culture through, for example, its weekly speed networking breakfasts. The washrooms and WCs are located at the back of the concourse which is somewhat inconvenient, but an admissible decision for a commercial retail venture that must recoup its investment and meet break-even obligations. For customers who bring 20 or passengers, the facilities which include shower rooms, are free to use. There are also limits on parking which is free for the first 2 hours, after which site specific charges apply up to a maximum charge of £25 per day. It is highly probable that the charges are as much pragmatic as commercially-geared, and imposed to ease traffic and retain a more relaxed atmosphere. Whether the investment is money well spent is too early to tell at this juncture, however the site appears to be well thought through from a design perspective and most definitely fit for purpose.